Head coach Gregor Townsend will demand Glasgow put a halt to second-half lapses after the Pro12 leaders fell off the pace against Cardiff Blues. The Warriors trounced the visitors 36-17, securing a bonus point before half-time, but shipped two late tries. 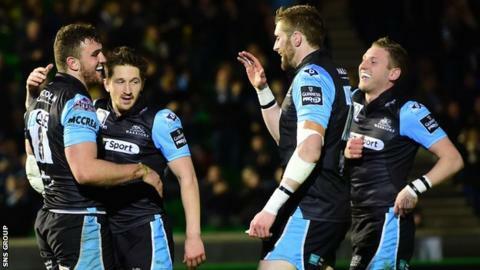 It is the third successive match in which Glasgow have slackened having established a commanding lead. "We're disappointed by our second-half performance - we need to set ourselves higher standards," said Townsend. "There were a lot of changes, there were players who hadn't played for weeks and months and a lot of the were coming onto the field at the same time. "Cardiff played really well, had most of the ball in second half, but we did make it quite easy for them. "Overall, we're delighted to get the bonus point. I thought Cardiff in the first 20 minutes made it very hard for us, they defended really well, and it took us a while to break them down. "We had to be very accurate and when we did that it led to tries. We just have to keep on defending and keep on playing. "We got the bonus point and we made changes (at half-time), so I take that as my responsibility to make sure the team's better than they showed in the second half." From inside centre, Peter Horne scored a spectacular hat-trick of tries in less than 15 first-half minutes, after strong displays against Leinster and Zebre. "He has been excellent for us over the last three years," said Townsend. "He was very, very good for us during the Six Nations, bounced back from being left out of the last two games really well. "He was one of our best players over in Leinster, and tonight he was great. He's really stepped up as a goal-kicker the last few games, so he's added another string to his bow. He's played 10 for us and Scotland but also showed his worth as a 12." Scotland head coach Vern Cotter was among the Scotstoun spectators, and the New Zealander watched Horne rack up 24 points, picking a host of incisive support lines, before a tweaked hamstring curtailed his involvement. "It was great, we started to play some good rugby, get ball into our dangerous runners' hands and I managed to sneak on the end of them," said Horne. "All I can do is keep my head down, work as hard as I can and improve every week. The ethos we have at Glasgow is really helping me and I'm just enjoying my rugby. You've got to earn your jersey back and that's exactly what I'm trying to do."